Werth currently offers two types of wall-mounted racks for physical therapy equipment: The Folding Walker Storage System that holds up to 10 folding-walkers, and the Crutch Rack that holds up to 5 sets of standard and junior size crutches. Materials: Mild steel construction with gray powder coat finish. Includes: 8 screws, 8 washers, and 8 drywall anchors and installation guide. Michigan Nonprofits: Email a copy of your nonprofit paperwork to chris@addwerth.com to get a discount code for tax exemption. 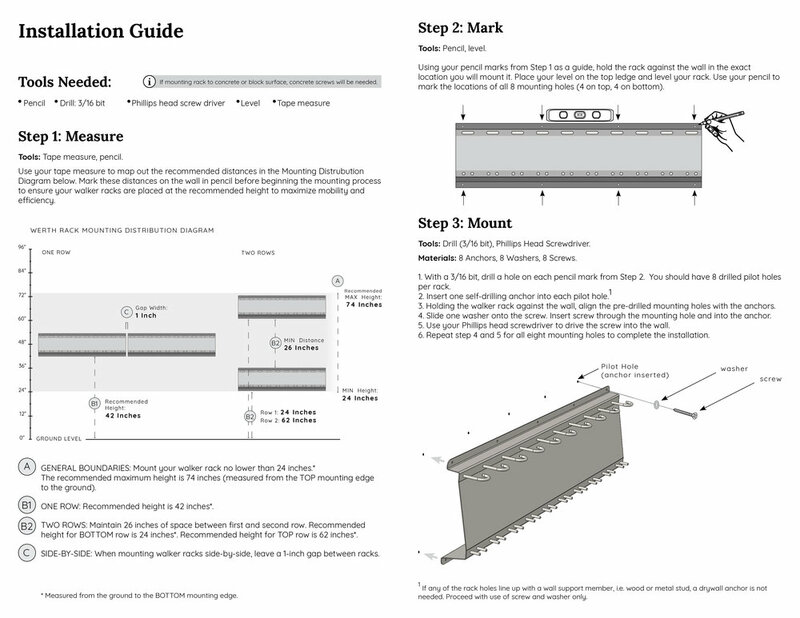 Each Walker Rack comes with mounting hardware (8 screws, washers, and drywall anchors) and the installation guide.